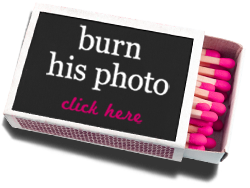 I have blogged about Sweet Revenge but never thought that there was a website dedicated to all the girls out there that have run into Mr. Wrong. Let me introduce you to Pink Kisses www.pinkkisses.com an adorable website (not to mention ultra PINK), empowering women to move on with their lives. Ellie the creator of PinkKisses.com found herself dealing with a bad breakup and instead of wasting her time month after month waiting for him to call she took control of her life and sent the flowers that her Ex never did with the quote ‘Girl, you are way too good for some guy who won’t even send you these. Don’t waste another tear on him.’and Pinkkisses.com was born. “The site allows you to send feel-good flowers, chocolates, mood boosting texts, and emails to yourself or a grieving friend. A great feature on this site is their blog, where you can bond over your EX-periences with women who have walked in your shoes. Beauties, never think you are the only fab gal that has a run in with a bad breakup, we have all been there, put your relationship in perspective and move on with your GLAMOROUS life.